Trump claims Paul Manafort had little influence on him during his three months as his campaign manager last year. 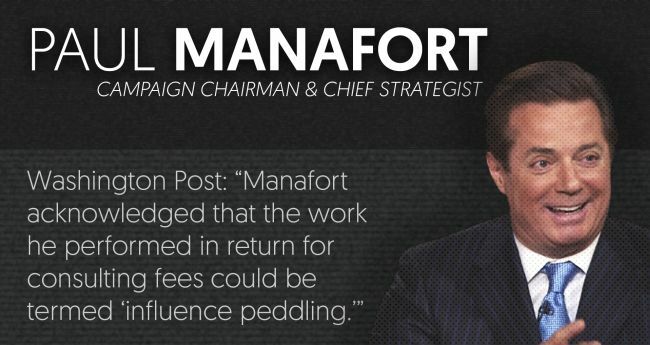 Basically Trump has acted like he barely knows Manafort. Guess what? We now know that Jared Kushner (Trump's son-in-law) and Manafort go back a long way. Their connection? What else but real estate? As the Russian inference committees progress, Manafort will called upon to testify. Meanwhile he's been investigated by the New York attorney general and Manhattan's district attorney over real estate dealings. Think about that...real estate dealings. 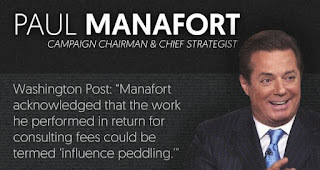 Manafort. Kushner. Trump. Kushner is going to have to testify before one or more committees about his Russian connections - beyond Manafort - like a certain Russian banker who has a direct line to Putin. And speaking of direct lines: investigators would like to know more about Kushner's attempt to set up a "back channel" between Russia and Trump before he took office. Real estate runs through the Manafort-Trump relationship. In 2006, a limited liability company linked to the Manaforts purchased a unit in Trump Tower on Fifth Avenue. Stay tuned for the next installment of "As Trump Turns."